The Nuu-chah-nulth Tribal Council has named Andrew Callicum as its next vice-president with a byelection vote today. Callicum won over Pamela Webster with a vote of 52-30 from NTC society members who cast ballots on behalf of 14 Nuu-chah-nulth nations. The Nov. 30 byelection took place at an extraordinary general meeting in Port Alberni, with the result announced at Maht Mahs. The vice-president election was initially scheduled for the NTC Annual General Meeting in late September, but a byelection was deemed necessary when no eligible candidates stepped forward to replace outgoing Vice-President Ken Watts. Callicum thanked Webster for running. Both candidates introduced themselves publicly and answered questions at a forum the preceding evening on Nov. 29 at Maht Mahs. “I’m incredibly thankful for this opportunity,” said Callicum. 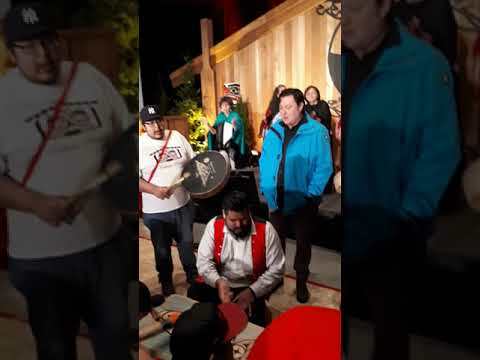 He recently served as the executive director of the Heiltsuk Tribal Council and was tribal administrator for the Hesquiaht First Nation from 2015-16. With years of experience as an employment counsellor, Callicum’s resume also includes managing the Nuu-chah-nulth Employment and Training Program. The vice-president term lasts until the next election in September 2021, when Callicum can run again if he chooses. The position is responsible for national issues affecting Nuu-chah-nulth-aht, and eligibility of candidates is determined by the electoral officer. Criteria includes being a member of a Nuu-chah-nulth nation, knowledge of First Nations culture, traditions and governance as well as experience in conflict resolution, lobbying, government and media relations. Twenty signed endorsements are required from members of Nuu-chah-nulth nations to be an eligible candidate. On the same day as the byelection, some delegates at the general meeting questioned if the eligibility requirements are best serving Nuu-chah-nulth nations. Two individuals who wanted to run for vice-president were deemed ineligible by the electoral officer, and Nuchatlaht Councillor Archie Little said that the NTC president and vice-president need to be accountable to the nations, not a predetermined structure. A motion was passed to amend the bylaw dictating eligibility for the NTC’s top elected positions, with directors expecting to meeting in early 2018 to discuss how the stipulations can be changed.